I spoke briefly about this project in the fall, but in the swarm of work that has occurred since December, haven't spoken much since. 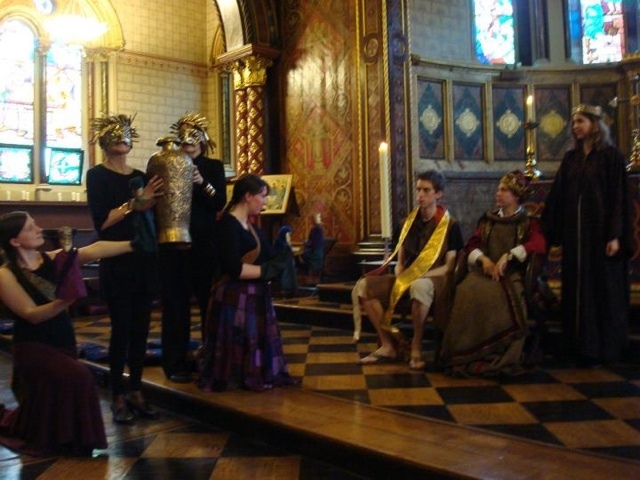 This project, based in a long-term relationship RADA has had with King's College London, is an opportunity for MA Text & Performance students to direct a production populated by MA Latin students at King's. Outside of the play selection, the date, the location, and the necessity not to cut any of the latin text, the directors are given free reign on how to proceed. 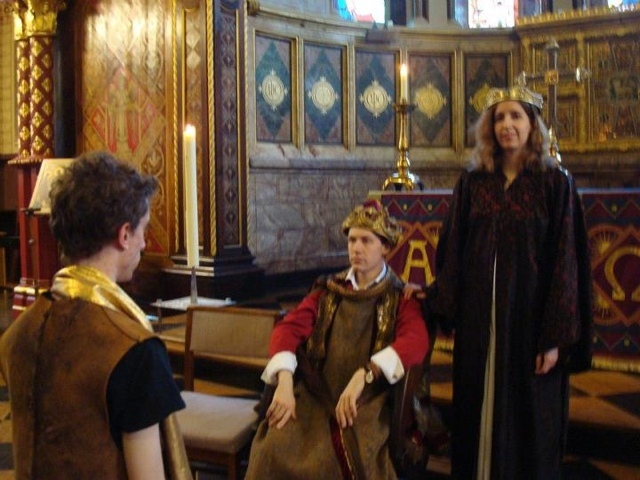 Our play was Ludus Danielis - the story of Daniel - the c.1140 Beauvais play, in Medieval Latin and French. The location: the beautiful King's College Chapel inside the Strand Campus. So far, so good. Three of us from the MA T&P volunteered, and agreed to work together to co-direct the piece. This worked remarkably well, as each of us had the chance to jump in on areas where we were most interested or expert, allowing the overall production to have a very lively feel; a major accomplishment with an 800 year old play in a language very few speak or understand. Our decision was to approach the story as a fairy tale of sorts; The student actors began as their "normal" selves, coming in as if they, too, were going to see the production. From here, we had 2 magical stagehand/ushers and a musician who weaved them into a magical land, wherein they took on the characters of the Beauvais play, and the play began. With limited cast, we opted to use puppets to populate chorus parts such as nobles or satraps, which traditionally would have been performed by larger choruses. This worked extremely well, adding a slight comic element to the piece. Now, adding comedy to a 12th century liturgical drama might seem odd, however our dramaturgical research uncovered evidence that these plays would have been fun and not purely serious; the role of early liturgical dramatic pieces was to engage the parish in the bible stories in a way that would be fun and exciting, particularly given that few would have understood Latin - much like our present-day audience. Another feature we added was music; a leitmotif was created for each character, which played as they began or ended an important speech or moment. This was in reference to the musical nature of these plays (many would have been fully or partially sung) and also to help the audience follow along with the story. Overall, the production was a success. 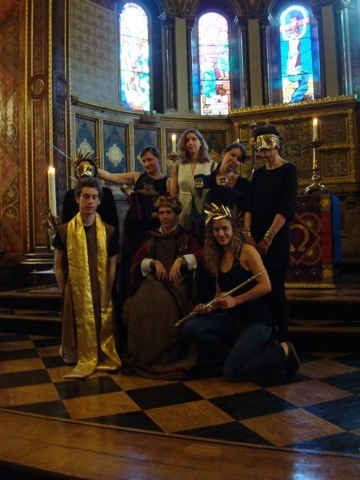 Our performers had a fabulous time, and reports from audience members was that the production was highly enjoyable. I look forward to this sort of unusual challenge again.